For the system of military recruitment, see Canton System (Prussia). 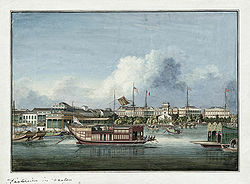 The Canton System (1757–1842) served as a means for China to control trade with the West within its own country by focusing all trade on the southern port of Canton (now Guangzhou). Known in Chinese as the Yīkǒu tōngshāng (一口通商, "Single [port] trading relations") the policy arose in 1757 as a response to a perceived political and commercial threat from abroad on the part of successive Chinese emperors. From the late seventeenth century onwards, Chinese merchants, known as Hongs (háng, 行 ), managed all trade in the port. Operating from the Thirteen Factories located on the banks of the Pearl River outside Canton, in 1760, by order of the Qing Qianlong Emperor, they became officially sanctioned as a monopoly known as the Cohong. Thereafter Chinese merchants dealing with foreign trade (known as yángháng (洋行, literally "ocean traders", i.e. 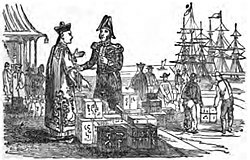 "overseas traders" or "foreign traders") acted through the Cohong under the supervision of the Guangdong Customs Supervisor (Yuèhǎi guānbù jiàn dù, 粵海關部監督), informally known as the "Hoppo", and the Governor-general of Guangzhou and Guangxi. At the start of his reign, the Kangxi Emperor (r. 1661–1722) faced a number of challenges, not the least of which was to integrate his relatively new dynasty with the Chinese Han majority. The Manchu Qing had only come to power in 1644, replacing the Ming dynasty. Support for the previous rulers remained strong, particularly in the south of the country. Now the whole country is unified, everywhere there is peace and quiet, Manchu-Han relations are fully integrated so I command you to go abroad and trade to show the populous and affluent nature of our rule. By imperial decree I open the seas to trade. Hǎiguān (海关), or customs stations, were subsequently opened at Canton, Xiangshan County (Zhuhai and Zhongshan) and Macau in Guangdong Province; Foochow (Fuzhou), Nantai (Southern Fuzhou) and Amoy (Xiamen) in Fujian Province; Ningpo (Ningbo) and Dinghai County (Dinghai District) in Zhejiang Province; and Huating County (Huating Town, Shanghai), Chongque (No longer exists) and Shanghai proper in Jiangsu Province. One year later in 1685, foreign traders received permission to enter Chinese ports. The Qing Court under Kangxi set up a trading company in Canton in 1686 to deal with Western trade known as the Yánghuò Háng (洋货行, literally "Ocean Trading House"). This dealt with both imports and exports with sub-offices responsible for taxes and import/export declarations respectively. When a ship arrived or departed, the Chinese merchant involved would visit the Ocean Trading House to pay any taxes due. This set up became the basis for the later Thirteen Factories through which all foreign trade would be conducted. Although he now had the foreign trade situation under control, Kangxi's liberal attitude towards religion led to a clash between Chinese and Christian spiritual authority. After Pope Clement XI issued his 1715 papal bull Ex illa die, which officially condemned Chinese religious practices, Kangxi expelled all missionaries from China except those employed in a technical or scientific advisory capacity by the Qing Court. Thereafter a growing climate of xenophobia and suspicion towards all foreigners on the part of the Chinese scholar-bureaucrats responsible for administering the empire took over. In 1745, Kangxi's grandson the Qianlong Emperor ordered his court to implement changes to the Ocean Trading House system. Thereafter a local Chinese merchant stood as guarantor for every foreign trading vessel entering Canton Harbour and took full responsibility for the ship and its crew along with the captain and supercargo. Any tax payments due from a foreign trader were also to be guaranteed by the local merchant. With permission from the authorities, in 1760 Hong merchant Pan Zhencheng (潘振成) and nine others hong specializing in the western trade joined together to become the intermediary between the Qing government and the foreign traders. The role of the new body would be to purchase goods on behalf of the foreigners and deduct any taxes and duties payable for imports and exports; at the same time, according to Guangdong customs records (粤海关志, Yuèhǎi guān zhì), they established a new harbour authority to deal with tribute from Thailand and handle pay for the troops involved in trade as well as manage domestic maritime trade in the South China Sea. Henceforth, the Cohong possessed imperial authority to levy taxes on the foreign merchants as they saw fit. With the Cohong in place as a virtual monopoly, import/export prices became fixed and left no room for individual negotiation. While this gave Qing officials greater control over foreign trade, it proved to be a major restriction on the traders themselves whose many protests over the new system fell on deaf ears. When foreign traders began to submit complaints about their dealings in Canton directly to Beijing in the 1750s, the emperor and his officials became alarmed at this breach of normal protocol and realized that something had to be done to control the situation. The Qing court's previous laxity had effectively allowed a coterie of Chinese merchants and local officials to take over foreign commerce in the southern port according to their own best financial interests. One of the fundamental tenets of traditional Chinese diplomacy prohibited contact with Beijing except in the case of tributary envoys from other states. Although the foreign merchants knew of this restriction, they had to balance a breach of etiquette against the risks of seeing their substantial investments in China destroyed by bribery and corruption. Englishman James Flint, a long-term East India Company supercargo and a fluent speaker of Chinese, became the focus of the impetus for change. 1) Trade by foreign barbarians in Canton is prohibited during the winter. 2) Foreign barbarians coming to the city must reside in the foreign factories under the supervision and control of the Cohong. 3) Chinese citizens are barred from borrowing capital from foreign barbarians and from employment by them. 5) Inbound Foreign barbarian vessels must anchor in the Whampoa Roads and await inspection by the authorities. A seemingly insatiable western demand for tea from China towards the end of the 18th century caused a significant deficit in the British balance of trade. The Chinese had little interest in Western goods and would only accept silver in payment. This spurred the East India Company to sell opium grown on its plantations in India to independent traders, who shipped it on to China to sell in exchange for silver. China prohibited the importation of this opium, but the traders persisted. Chinese attempts to regain control led to the First Opium War, when British gunboat diplomacy quickly forced China to relent and open additional trade. Following the signature of the 1842 Treaty of Nanking, British subjects are "allowed to reside, for the purpose of carrying on their mercantile pursuits, without molestation or restraint" at Canton, Shanghai, Amoy (Xiamen), Ningpo (Ningbo) and Foochow (Fuzhou). In addition, Article V of the Treaty specifically abolishes the Canton system, allowing British merchants, and eventually all foreign merchants, to deal with whomever they please in the newly-opened ports. In 1859 Canton's trade moved to a new site on the reclaimed sandbank of Shaming Island, a short distance west of the former factories. By then much of the foreign trade with China had shifted to the by then British colony of Hong Kong (acquired under the Treaty of Nanking), and to the northern ports, with their advantage of proximity to Beijing as well as the Grand Canal and the Yellow River, both vital arteries in the internal trade of Qing China. By 1866, only 18 foreign firms still had offices in Canton while there were only 60 foreign residents excluding British Indians and tidewaiters (who boarded boats as part of custom's inspections) employed by Sir Robert Hart's Imperial Maritime Customs Service. By the time Hong Kong became a full-fledged British Colony, many of the merchants would be led by a newer generation of western hong merchants. Many of these companies would become the backbone of the young Hong Kong economy. ^ "Scene in China" (PDF). The Wesleyan Juvenile Offering: A Miscellany of Missionary Information for Young Persons. Wesleyan Missionary Society. IX: Vignette. 1852. Retrieved 24 February 2016. ^ Li, X. (2012). China at War: An Encyclopedia. ABC-CLIO. p. 201. ISBN 978-1-59884-415-3. ^ Mote, F.W. (2003). Imperial China 900-1800. Harvard University Press. p. 850. ISBN 978-0-674-01212-7. ^ Schottenhammer 2007, p. 31. ^ a b Li 1977, p. 363. ^ 今海内一统，寰宇宁谧，满汉人民相同一体，令出洋贸易，以彰富庶之治，得旨开海贸易 from 周膺; 吴晶 (2011). Research study on Hangzhou Trade in the Late Qing and Republican Eras (晚清民国杭商研究) (in Chinese). Hangzhou Publishing House (杭州出版社). ISBN 978-7-80758-499-5. ^ Schottenhammer 2010, p. 126. ^ Taipei Research Institute (台北研究院) (1987). "Fifth compilation of Ming/Qing historical material (明清史料戊编)". 1. Taipei: Zhonghua Publishing Bureau (台北: 中华书局). : 102. ^ a b 吴伯娅 (January 1, 2010). "A Complaint about the Single Port Trading Policy (一纸诉状与一口通商)" (in Chinese). Chinese Culture MediaCentre (中国文化传媒网). Archived from the original on February 2, 2014. Retrieved January 27, 2014. ^ Mantienne 1999, p. 178. ^ Dun 1969, p. 22. ^ Gao & Feng 2003, p. 109. ^ Fairbank & Têng 1941. ^ a b Schottenhammer 2007, p. 33. ^ Shurtleff & Aoyagi 2012, p. 1711. ^ "Western Cultural Policies during the Qianlong and Jiaqing Eras (乾嘉时期清廷的西方文化政策)" (in Chinese). Historychina.net (中华历史网). Retrieved January 30, 2014. ^ "The Government of China having compelled the British Merchants trading at Canton to deal exclusively with certain Chinese Merchants called Hong Merchants (or Cohong) who had been licensed by the Chinese Government for that purpose, the Emperor of China agrees to abolish that practice in future at all Ports where British Merchants may reside, and to permit them to carry on their mercantile transactions with whatever persons they please". ^ Dennys 1867, p. 138. Dennys, N.B. (1867). The Treaty Ports of China and Japan: A Complete Guide to the Open Ports of Those Countries, Together with Peking, Yedo, Hongkong and Macao. London: Trubner. ISBN 978-1-108-04590-2. Dun, Jen Li (Trans.) (1969). China in transition, 1517–1911. New York, Van Nostrand Reinhold, Inc. ISBN 0-442-04778-9. Fairbank, J.K.; Têng, S.Y. (1941). On the Ch'ing Tributary System. Harvard Journal of Asiatic Studies. 6. pp. 135–246. Li, V. H. (1977). Law and Politics in China's Foreign Trade. Asian law series. University of Washington Press. ISBN 978-0-295-80387-6. Mantienne, Frédéric (1999). Monseigneur Pigneau de Béhaine (in French). Paris: Editions Eglises d'Asie. ISBN 978-2-914402-20-0. Schottenhammer, Angela (2007). The East Asian Maritime World 1400–1800: Its Fabrics of Power and Dynamics of Exchanges. East Asian economic and socio-cultural studies. Harrassowitz. ISBN 978-3-447-05474-4. Schottenhammer, Angela (2010). Trading networks in early modern East Asia. Wiesbaden: Harrassowitz Verlag. ISBN 3-447-06227-4. Stifler, S.R. (1938). "The language of students of the East India Company's Canton factory". Journal of the North China Branch of the Royal Asiatic Society. 69. Gao, Shujuan(高淑娟); Feng, Bin (冯斌) (2003). Comparative Outline of Chinese and Japanese Foreign Policy: Central Trade Policy in the Final Years of the Imperial Era (中日对外经济政策比较史纲: 以封建末期贸易政策为中心). Qinghua University Chinese Economic Historiography Series (清华大学中国经济史学丛书) (in Chinese). Qinghua University Publishing (清华大学出版社). ISBN 978-7-302-07517-2. Shurtleff, W.; Aoyagi, A. (2012). History of Soy Sauce (160 CE To 2012). Soyinfo Center. ISBN 9781928914440. Louis Dermigny, La Chine et l'Occident: le commerce à Canton au XVIIIe siècle, 1719–1833. Paris: SEVPEN, 1964. Downs, Jacques M. (1997). The Golden Ghetto: The American Commercial Community at Canton and the Shaping of American China Policy, 1784-1844. Bethlehem, PA: Lehigh University Press; reprinted, Hong Kong University Press, 2014. ISBN 0934223351. Johnson, Kendall A. (2017). The New Middle Kingdom: China and the Early American Romance of Free Trade. Johns Hopkins University Press. ISBN 9781421422510. Paul Arthur Van Dyke. The Canton Trade: Life and Enterprise on the China Coast, 1700–1845. Hong Kong University Press, 2005. ISBN 962-209-749-9. Zhuang Guotu, Tea, Silver, Opium, and War: The International Tea Trade and Western Commercial Expansion into China in 1740–1840. Xiamen: Xiamen University Press, 1993. This page was last edited on 9 April 2019, at 08:31 (UTC).